We are officially recognized as a Great Place To Work by the international Great Place To Work Institute! This follows an employee survey into the levels of trust, pride and fun we experience, and an in-depth analysis of our organizational culture. What does it take to be Great Place To Work Certified? From the perspective of employees, a Great Place To Work is an organisation where you trust the people you work for, have pride in what you do and enjoy the people you work with. From the managers’ perspective, it is an organisation where organisational objectives are being achieved, with employees who give their personal best working as a team in an environment of trust. 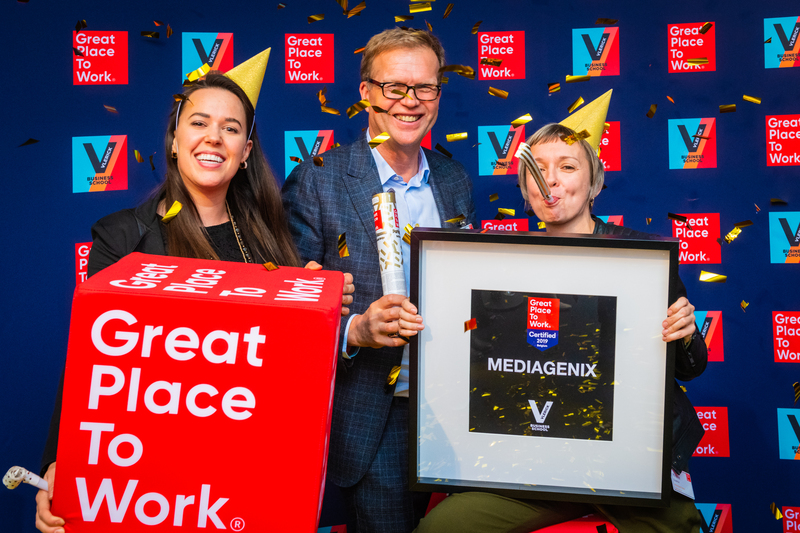 Being Great Place To Work Certified means that MEDIAGENIX meets the strict criteria set by the Great Place To Work Institute. On the Trust Index Survey, which measures employee perceptions of their workplace, companies must score higher than 70%. For the Culture Audit, completed by management and evaluated by an independent Great Place To Work team, companies must score higher than 50%. The Great Place To Work Institute conducts research and recognizes leading workplaces in more than 50 countries on different continents. The team in Belgium partners with Vlerick Business School.